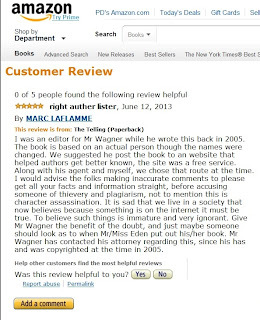 I know it is small consolation, but you have a number of supporters who have posted scathing comments on Mr. Wagner's page on Amazon calling him out for his thievery. You have our support Eden. Unfortunately, there are always people like that, who seek to profit from the labors of others and then feel so entitled that they can't accept responsibility for their actions - it's just not their fault. I'm glad people figured out what was going on relatively quickly, so that the situation can be resolved and you can go on with your life. I still find it strange that someone would take my best-known work. Then again, he may have just seen that it was free and figured no one would care. I think you're right that people see something offered for free and think no one cares. :( Our society is so fixated on money it's crazy. So he sees a way to lift a book to make a buck. What a prince. That he actually tried to concoct some kind of defense is laughable. No agent would ever suggest putting a work up for free. Thank goodness people caught onto this idiot so quickly. And the publicity might actually prompt some action this time. Amazon and other sellers of book really need to start checking for plagiarism. If colleges can do it, why not businesses who make money off intellectual property? Surely they have some responsibility to make sure they're not offering stolen goods? Someone also pointed out the typos in the "editor's" post. I'm not sure what will happen, but the other three stolen books were through publishers, I believe. I'm sure the publishers have legal teams to handle this sort of thing. I am blown away by this. I am sorry you have to experience it. I hope Amazon keeps you posted. I recently read a blog story from one of the artists at Dreamspinner press about someone blatantly copying his art work (and others) and selling it on Ebay. I guess the moral gene was left out of these people. I've always been fascinated by the way people's minds work, and how some folks are honest and others aren't or how some feel remorse while others seem not have the slightest twinge. I checked this morning and the listing is still there, but it serves as evidence I suppose. Thank you so much for spreading the word. I hope all authors reading will rush out immediately and register all their books with the copyright office if they haven't already. In an Amazon forum Mr. Wagner stated that he contacted all authors involved and explained what happened (his ghostwriter did it! ), but I haven't heard from him. I also wonder how he'd explain the things his editor said. 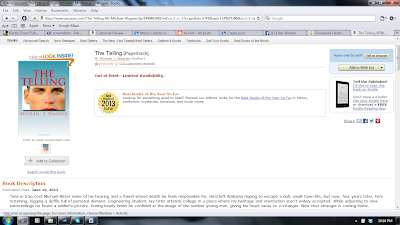 His listing for The Telling is still up at Amazon, though marked as unavailable. My takedown requests to Amazon haven't been heeded. 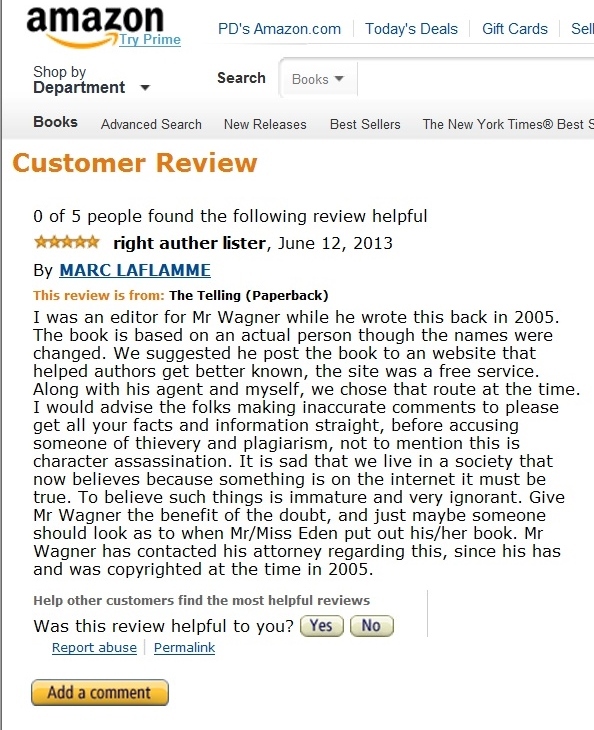 Hi Eden, I truly do not understand why Amazon took down all the books he stole, but yours. Yeah, sure his ghostwriter did it. Forgive me for being cynical and not buying it :(. So sorry it happened to you. Thanks, Sirius. At this point I'll just say to leave it there for evidence. There's about a dozen comments on the post showing support for me, which is nice. People can be awful at times (like this guy), but others are so amazing. *hugs* I cannot believe the nerve of some people. I'm still in shock. *Hugs* How've you been, Eyre?